Credit unions have helped jump-start car sales by funding consumer loans when the domestic automakers' finance companies were short of cash. Now initiatives are afoot that could allow credit unions to provide inventory financing to new-car dealers too. Many lenders that are skittish about auto sales are yanking dealers' credit lines for wholesale inventory financing, or floorplans. Those dealerships soon go out of business if they fail to line up another lender quickly. Some credit unions view the floorplan crisis as an opportunity to expand their automotive finance portfolios so they are seeking ways to meet dealers' commercial lending needs. "Every dealer is a part of our Main Street business communities," says Henry Wirz, CEO of SAFE Credit Union, a large institution serving the four-county Sacramento, Calif., area. "We want to keep them in the community. Support for them is critical." Sid DeBoer, CEO of Lithia Motors Inc., works extensively with credit unions to provide retail financing for customers. An expansion into floorplan financing "would be terrific," says DeBoer, whose public dealership group is based in Medford, Ore. SAFE and other credit unions are meeting with representatives of the National Automobile Dealers Association to discuss how the institutions can assist dealers. "Dealers often don't realize they can go to credit unions for working-capital loans and also for mortgages," says John Lybolt, NADA's vice president of dealer services. But Lybolt says providing floorplan financing — typically millions of dollars — is a challenge. The problem isn't willingness to lend. Federal law caps credit unions' commercial loans at 12.25 percent of their assets, explains Pat Keefe, a vice president of the Credit Union National Association, a trade association serving credit unions. Many credit unions are small, and their typical commercial loan is $200,000, Keefe says. The association's U.S. Credit Union Profile shows that median assets for a credit union totaled $14.5 million in 2008. "If they provided floorplan, they would bump up against that cap fairly quickly," Keefe says. Data from the national association show that only the 100 largest credit unions have assets exceeding $1 billion. With $1 billion in assets, a credit union's commercial loans are limited to $122.5 million. Tony Boutelle is CEO of Credit Union Direct Lending, an Ontario, Calif., provider of an online network of 700 credit unions that offer car loans through dealerships. "Credit unions see business lending as an important way to support their members," Boutelle says. But, he adds, "It is difficult to project how significant credit union participation in floorplanning could become." Credit unions and dealers are lobbying Congress to remove the cap on commercial lending. 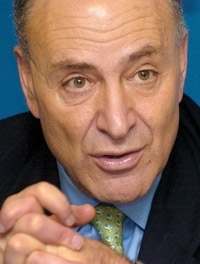 In March, Sen. Charles Schumer, D-N.Y., said he plans to introduce legislation to eliminate the statutory limit on business loans. Schumer hasn't made his move yet, but Keefe says the Credit Union National Association hopes the senator will act soon. "With so many large banks in bad shape, credit unions are becoming increasingly important, especially with regard to small businesses that need relatively small lines of credit," Schumer said in his announcement. If Congress doesn't act, some credit unions still may find a way around the cap, says Wirz of SAFE Credit Union. Credit unions already pool their resources to provide multimillion-dollar loans to large churches, and they could do the same for auto dealerships, Wirz says. The lead credit union in the group might provide just 10 percent of the credit line, leaving plenty of funds to make more loans. Wirz adds: "There's some room to maneuver."